Should We Laugh? Cry? Both? The ritual is becoming familiar. Health care reform passes a major political hurdle. And progressives don’t know whether to laugh or cry. Last time, the occasion was a vote in the House of Representatives. Health care reform passed by the slimmest of margins, but not before conservative Democrats had extracted a major concession on abortion rights. This time, it was a vote in the Senate--not on whether to pass a bill, but whether to begin debating one. This measure, too, passed by the slimmest of margins, but not before conservative Democrats and one notorious independent made clear they were prepared to shut things down later if legislation includes a public insurance option. It’s no fun to watch this unfold. And yet this is the exactly the sort of drama you should expect for the next few weeks, as the Senate deliberations play out. 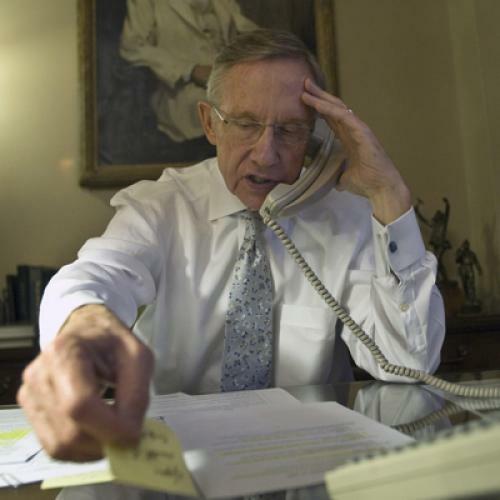 The bill Majority Leader Harry Reid introduced last week is not everything it could be--not by a long shot. And progressives will try their best to improve it. But the real battle will be an ongoing rearguard action, to fend off changes from the right--amendments that, in many cases, Republicans will support even though they have no intention of voting for the final bill. Abortion. Immigration. The mandates, for individuals and employers. You name it. For progressives, victories are more likely to come in the form of ground not conceded than ground gained. Every day that legislation doesn’t get worse is a day to cherish. That may not sound like much to celebrate. But to get a bit of perspective, glance over to the other ideological corner--where the right, and many of its kindred special interests, are going absolutely crazy. To some extent, they are reacting merely to the possibility that President Obama and his allies will get a political victory. But they are also reacting to the fact that health care reform, even in this highly compromised form, will have an impact. Reform will mean government meddling with health care in a way it never has before, to discipline the insurance industry and reorient the incentives that make our care so expensive in the first place. It will mean offering financial support to millions--no, tens of millions--of poor and middle-class Americans struggling to keep up with their medical costs. And on and on and on. That doesn’t mean the blows don’t hurt. Blanche Lincoln’s speech on the Senate floor Saturday was like a gut punch. Her condemnation of the public insurance option was not particularly persuasive, at least not if you believe--as I do--that reform with a public option would mean better, more affordable insurance than reform without one. But her stance seemed unambiguous--and unyielding. Joe Lieberman and Ben Nelson seemed equally obstinate. Maybe somebody (Charles Schumer?) will find yet another twist on the idea, one that all three would find acceptable. It might even involve a trigger--which, truth be told, may not be as awful as its reputation. The left treats the idea like poison, perhaps because it’s so closely associated with Olympia Snowe and the frustratingly futile hunt for bipartisanship that soaked up so much of the summer. But, at least on paper, you could make the case that a well-designed trigger--emphasis on “well-designed”--could be as, if not more, effective than a poorly designed public plan, which seems to be the only kind of public plan that might possibly get by with conservative Democrats in support. To be sure, Liberals can flex their muscle, too. Bernie Sanders made very clear, in his own statements over the weekend, that he wasn’t guaranteeing to give his vote--particularly if conservative Democrats (and former Democrats) extract even more concessions. But the public option fight--however it turns out--could also help progressives in other ways. Whether out of pique, politics, or principle, Lieberman, Lincoln, and Nelson (and maybe one or two others) want to scream about something--and to have a concession they can claim as their own. If they end up demanding the public option as the price of their support--and I’m not saying I want that to happen--perhaps the rest of the bill can go through relatively unscathed. Or, to put it more starkly, if they didn’t have the public option to attack then it’d be the subsidies, or the price tag, or the insurance regulations. Merely by including the public option in his bill, Reid has increased the chances that the final bill is a good one--even if the public option is gone by the time deliberations are done. Am I confident things will work out well in the end--that the strategic decisions made so far, and the ones to be made soon, will be the right ones? Not at all. There’s plenty of room to second-guess everybody, from the president on down, and I’m sure we’ll all be doing lots of that. But however frustrating this process may seem, keep in mind that it’s hard--really hard--to hold sixty votes in line. When it happens, like it did this weekend, that’s usually a reason to feel good. Update: I've clarified the specifics of Starr's idea. Late Update: Reading this over again, I think I implied that anybody who opposes health care reform does not care for his/her common man. This is obviously not the case. It's entirely possible to oppose health care reform because you believe, honestly, it will do more harm than good. My point, rather, was that supporters of health care reform are at a strategic disadvantage when they bargain with relative skeptics like Lieberman or Nelson.